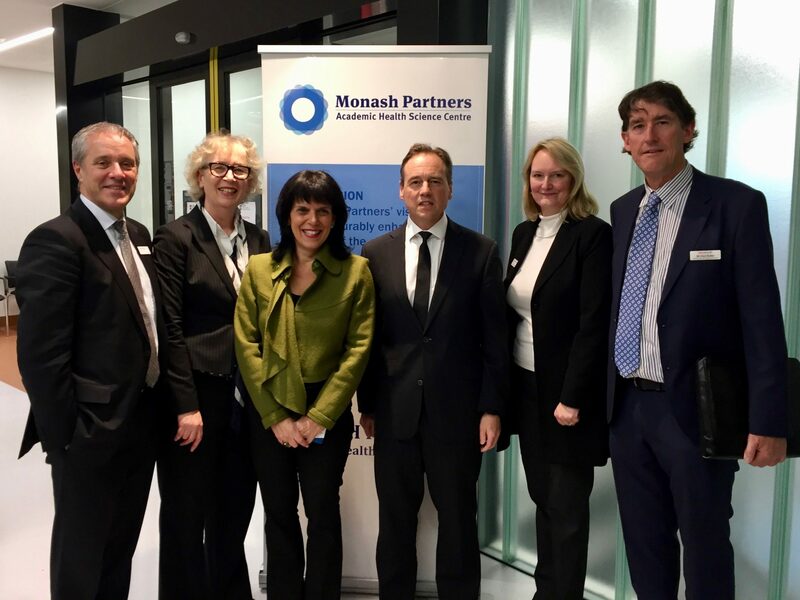 The Hon Greg Hunt MP, Federal Minister for Health visited Monash Partners recently to further show the government’s commitment to bring health services, researchers and educators together to find innovative new solutions for everyday health care challenges. Monash Partners are set to receive $2m investment from the Medical Research Future Fund (MRFF). Federal Health Minister Greg Hunt MP and Chisholm federal Liberal MP Julia Banks announced the federal government’s investment in the MRFF, to be spent over two years, during a visit with Monash Partners and a tour of the Monash Health Translation Precinct in Clayton this afternoon. Monash Partners is the first Advanced Health Research Translation Centres (AHRTC) to be funded under the MRFF. Monash Partners facilitates the collaboration of world-class talent across local universities, medical research institutions, hospitals and primary health care to support better ways to manage patient care. Mr Hunt said Monash Partners and the Government have agreed to prioritise research projects focusing on blood cancer, lung cancer, dementia, diabetes and vaccinations. “Monash is evolving to become one of the southern hemisphere’s leading medical precincts and for us to contribute funding to make it better, to allow for more medical trials, means better health for patients and better outcomes for the local community,” Mr Hunt said. The Hon Greg Hunt MP (centre) accompanied by Julia Banks MP Federal Member for Chisholm (centre left), met with Monash Partners including Executive Director Professor Helena Teede (right); Professor Christina Mitchell, Dean, Faculty of Medicine, Nursing and Health Sciences (left); Mr Andrew Stripp, Chief Executive, Monash Health (far left),and Alfred Health’s Mr Paul Butler, Executive Director, Strategy and Planning (far right). 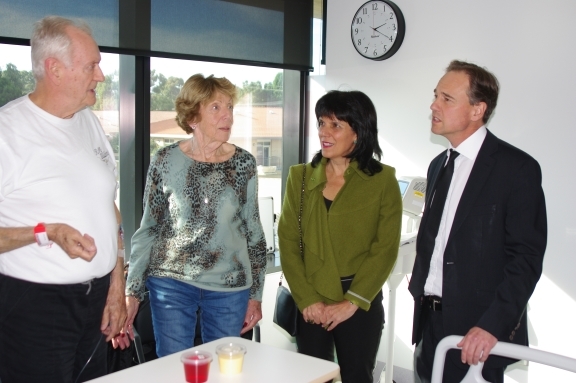 Minister Hunt chats with Doug West, a haematological cancer patient in hospital for a clinical drug trial, and his wife Anne. 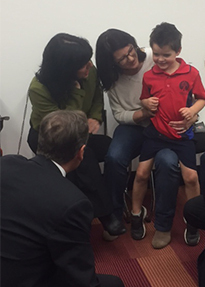 The Hon Greg Hunt MP chats with a young patient.